Rack Conveyor Dishwasher capable of washing up to 100 racks per hour ( 1800 plates). 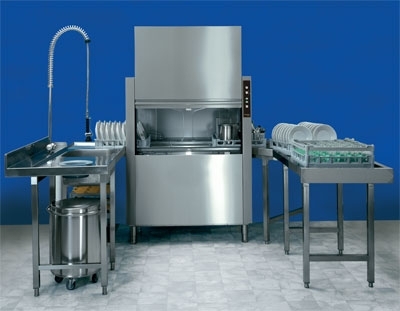 Compact design ( just 1150 mm long), reversible direction of operation, low running costs, simple to use controls, easy to clean interior, large panoramic door, integral Class A airgap, electronic controls, usable entry height - 400mm, hot or cold soft water connection recommended, supplied with a plate rack, cup rack and cutlery basket. This model is ideally suited to higher volume operations where a hood machine would not be sufficient.